Advances in nanomaterials and nanotechnologies offer important opportunities for cellular interfaces. In this presentation, I will give an overview of our recent progress by using graphene as active elements of bioelectronic devices. I will begin with a brief description of signal transduction mechanism at device-cell interfaces and then explain the challenges of currently available techniques. Next, our recent progress on graphene-based bioelectronic devices will be described, with a particular emphasis on their applications in electrophysiological recording. Lastly, I will discuss the sensitivity limit and scaling of graphene-based bioelectronic devices. Ying Fang got her B. S. in Chemistry from University of Science and Technology of China in 2002, then went on to Harvard University where she obtained her A. M. in 2004 and Ph. D. in 2007 at the Department of Chemistry and Chemical Biology, under the guidance of Professor Charles M. Lieber. She was then a postdoctoral fellow at Harvard. 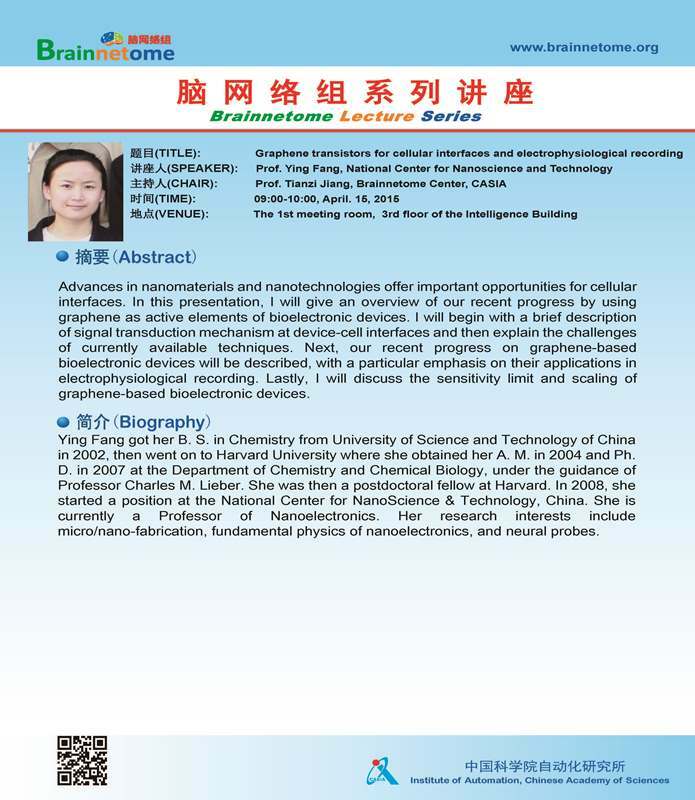 In 2008, she started a position at the National Center for NanoScience & Technology, China. She is currently a Professor of Nanoelectronics. Her research interests include micro/nano-fabrication, fundamental physics of nanoelectronics, and neural probes.